permission to be “terrifying/ and strange/ and beautiful” – "write pon di riddim"
*An updated note (May 2, 2016) is offset with an asterisk below. Late Saturday night (April 23, 2016) I noticed that Twitter was buzzing. So what did I do? I tuned in, sipped the tea, and read Lemonade. My moderate awareness of the gossip-columns provided me with insight into Beyoncé’s world of extraordinary professional and economic success that juxtaposes her very ordinary domestic and personal struggles that are fueled by the men closest to her heart: her father and her husband. But, by the end of the hour long experience the in-between spaces of Lemonade, those border spaces between songs, were the most captivating for me. It was not surprising to realize later that those in-between spaces were filled by the poetry of a border woman herself, Warsan Shire (a Kenyan by birth, Somali by parentage, and Londoner by address). Her words became the thread that laced the project together. Shire’s intensely introspective and powerfully vulnerable poems function as interludes during Lemonade, giving the film a necessary and critical framework. What I appreciate is how Shire also gives Lemonade viewers/listeners new levels of familiarity. You know, new – as in not old – and familiarity – as in a return to a known experience. Shire, does this. Not Beyoncé. Don’t you agree? We are all familiar with the Beyoncé formula: secret work, surprise release, slay, slay, slay. She did it for Beyoncé in 2013 when that visual and auditory project was exclusively released through iTunes. And she did it again with this tall glass of Lemonade, giving exclusivity to HBO on Saturday night, then Tidal, and the roll out will continue. Without Shire’s new poetry and without the new visual aids, the amalgamation of lyrics on Lemonade for me fall a bit flat or, at best, are just too familiar. Consider this: if we listen to the lyrics exclusively, Saturday’s Lemonade experience rang with much of the old familiarity of, say “Ring the Alarm” from 2006. Alas, as we all continue to sip and read, let us also ring the alarm. Beyoncé has brought Warsan Shire’s poetry to the masses. For that, I am grateful. 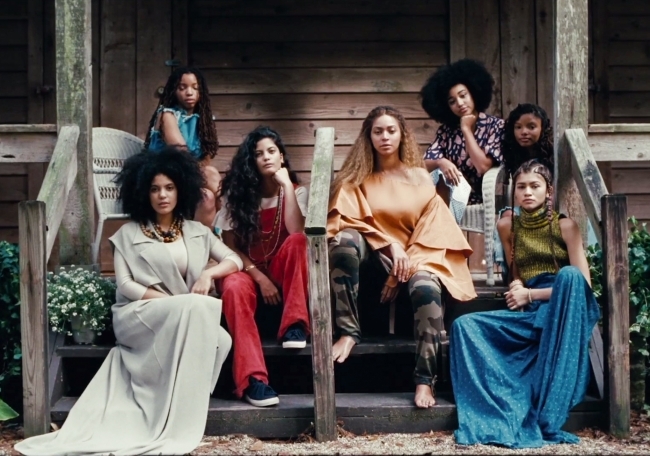 And let us ring the alarm again because Beyoncé has brought a long list of black artists back into popular discussion. The familiar melody of Isaac Hayes’ “Walk on by” is present on “6 Inch;” and the familiar female power of Afro-Caribbean santería is channeled in the gold Cavalli dress, the down-beat rhythm, and Jamaican-inflected chat of “Hold Up.” The familiar cycle of self-loathing that little black girls who are wounded by their fathers grow up to relive in their adult relationships is named, owned, and seemingly forgiven. The familiar oppression of patriarchy in a masculine society is interrogated. And the familiar need for sorority and the comfort of black girl sisterhood is suggested. These are just some of the recognizable moments that listeners/ viewers find familiar when experiencing Lemonade. But there are still more experiences of the familiar. So I thank Warsan Shire for re-familiarizing audiences with poets like Audre Lorde, Grace Nichols, Ntozake Shange, and Nikki Giovanni; writers like Gwendolyn Brooks and Jamaica Kincaid; and various genres of song bird story-tellers like like Mary J. Blige, Jill Scott, and Tina Turner. *Stylistically, the Lemonade visual album also, tangentially, calls forth for me Stephanie Black’s seminal documentary on the neo-colonial system that has limited Jamaica’s economic growth since the 1970s, Life and Debt (2001). While Black’s project would have been generously informative and engaging without it, it was enhanced by the familiar words of Antiguan author Jamaica Kincaid and her essay A Small Place. Kincaid’s own voice and own words from her 1988 book narrate the opening scenes of the documentary and immediately set the tone of the film. The movie’s visuals are confounded by the words, and confounded even more so because the words are familiar. It is an indisputable fact that black women in the postcolonial world had and continue to have an intimate relationship with pain. More than 150 years ago, black woman abolitionist Sojourner Truth asked “ain’t I a woman?” The answer Lemonade seems to give is: if pain is proof, then yes, we are women, through and through. Much of the writings, tweeting, and FB posts using the hashtag Lemonade speaks to the ways in which Beyoncé’s latest work has granted fellow black women permission to own their pain. Will Lemonade be for Beyoncé what Purple Rain was for the dearly departed Prince? Time will tell, I suppose, as it is only now that we are hearing the stories of how Prince permitted self-proclaimed “black weirdos” to exist freely. For now, it seems that Lemonade is being credited with liberating black women to know that they have the God-given and not husband-/ father-/ brother-/ man-given right to be and feel “terrifying/ and strange/ and beautiful,” to use Shire’s ventriloquized words (see the video for “For Women Who Are Difficult to Love“). Celebrities continue to drift into the role of patron saints of identity; but, won’t it be a beautiful day when all black women realize organically/ innately/ intuitively that being themselves and loving themselves and being loved in return is their birthright? I think it would. Prev we say no, but do our bodies say yes?